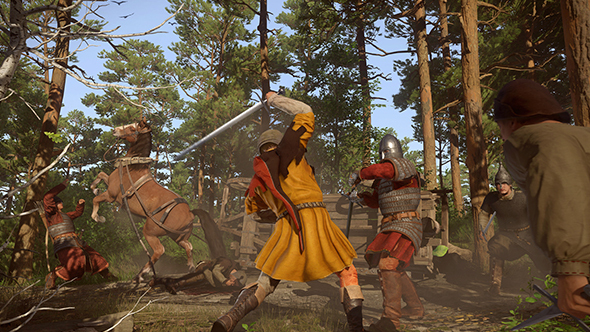 Kingdom Come: Deliverance aims to bring the scope, scale, and role-playing possibilities of an Elder Scrolls title out of the realm of fantasy and into the world of medieval history. So how does combat work when your swords are no longer legendary and your daggers no longer enchanted? A new developer diary explains exactly that. Find out how Kingdom Come: Deliverance is working to be a realistic Skyrim. Your weapon selections range from axes to swords and everything in between. Each of these weapons let you strike in a variety of ways from a variety of directions, and chaining these attacks together in a variety of ways forms the essence of combat. Hitting the same area repeatedly will start to break down your opponent’s armor, but they’ll quickly react and work harder to block those areas. That forces you to to start faking them out with one-two strikes to get at the area you’re targeting. Of course, if you’re more apt to use stealth and guile than end up in a fair fight, that’s certainly an option, and you’ll be free to do lots of sneaky stabbing on unsuspecting prey. Kingdom Come: Deliverance is due to release February 13, and in addition to deep combat it will also feature a full feces-flinging system. Precisely the game we’ve always needed.